Here is a lovely dollar store centrepiece made by Rhona G from Rambings of a Southern Girl be sure to click over to her site to get all the deets on how she made this inspiring creation. (Note the etched hearts on the glass). This one is from Southern Seazons. I love how the soup tureen fits right into the scheme, the table runner is gorgeous with the hearts and all that confetti on it and although you can’t see it in this picture (so go check out her site) she has even decorated the chandelier. My dear friend from You Can Always Start Now is actually the one who suggested to me that I should put out a tablescape challenge. Naturally I expected her to participate -lol. She is very supportive of me and all my endeavors and she is also very creative. Check out the wine glass, she used chalk board paint on the base, the initials AWT are for my blog (the idea came from Pinterest). I hope she knows I now expect to be served a drink in that glass the next time we hang out. Lastly, this is a centrepiece I made using mostly items I had or purchased from the Dollar Tree. The cake plate was a birthday present from my sister a few years ago and I love the fact it is red…the tie around the base is a scarf from Dollar Tree. I had some leftover flameless candles (from Christmas) and purchased the short glass vase, the string of red hearts and the glass beads, also from the Dollar Tree. 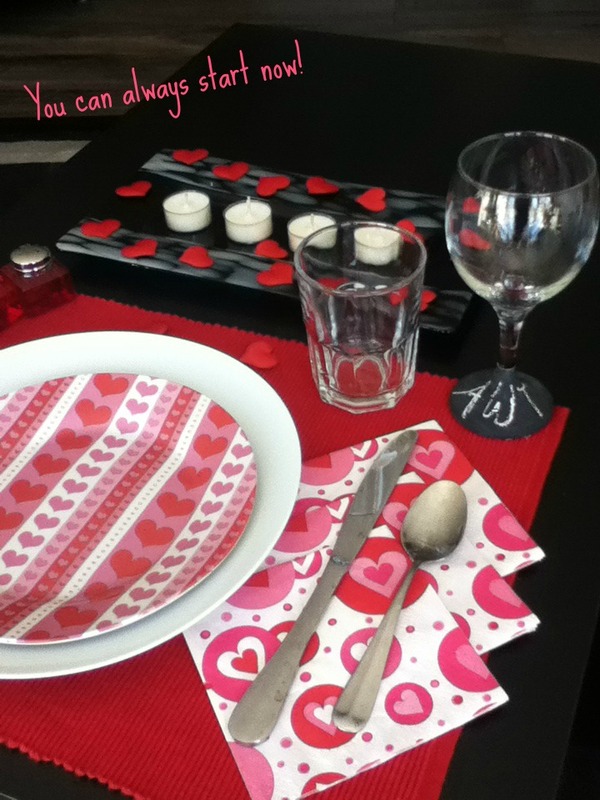 I will show you the rest of my tablescape on Valentine’s Day along with a recap of all these wonderful tablescapes. Thanks to all for contributing – It’s A Wandaful Thing!!! 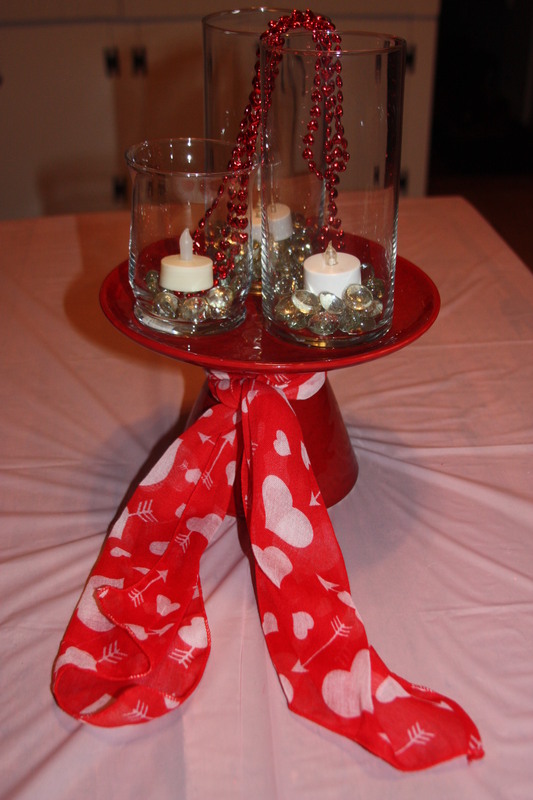 This entry was posted in Decorate and tagged candle, chalk paint, challenge, cheap, crafts, creativity, Decorate, DIY, dollar store, ideas, inexpensive, living, napkins, Pinterest, simple, Valentine. Bookmark the permalink.